The Prism Lifts S-440 Sit-to-Stand is an easy-to-use stand-up floor lift, designed for patients/residents with reduced mobility and physical strength who are unable to raise themselves independently. Patients must be able to weight bear and have a degree of self support. 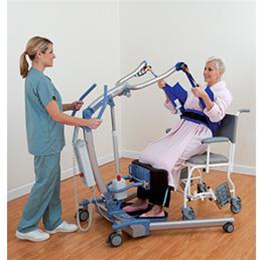 The S-440 Sit-to-Stand transfers the patient standing up, in a more dignified manner, providing the patient with a greater sense of security and the caregiver with improved working conditions. The S-440 Sit-to-Stand spreads the front legs in a full V-Spread, while the rear legs are fixed, thus providing a wide and stable base. The S-440 is designed with ease of use and flexibility in mind. It's made with aluminum so that it's lightweight and easy to move. The footplate is removable to allow for gate training and easy cleanup. The shin pad pivots and is height adjustable as well as forward-and-back. In conjunction with Prism Lifts slings, the S-440 maximizes patient comfort and caregiver ease of use.